For citizens of "The Lucky Country", we are surprisingly stressed! A survey by Compare The Market found that 72% of Australians said stress effects their physical health and 62% of Australians said it effects their mental health. Last year, I got so stressed I ended up extremely sick. I was paralysed and had a cancer scare. I needed assistance to do anything. If I walked or went to an event, I spent the next 3 or 4 days bedridden. I was in constant pain and ended up on high pain killers, nerve blockers and knocked out for large parts of everyday. It was not a life. Now, I am much more relaxed, live in a place I love and have found a lifestyle I love. 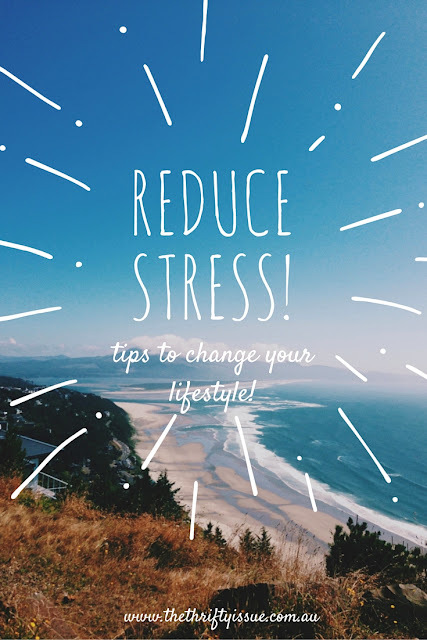 So how did I reduce my stress? How much stuff is in your home? How much do you use vs how much is stored? How much do you need? Go through every item you own and get rid of anything broken, unused or unneeded. I sold off my entire home bar a few things that fit in my car and moved interstate. It was extreme yet freeing. Do you live where you want to live? If not, why not? I moved at the end of last year. I was living in a large 4 bedroom home with 2 bathrooms, 2 lounge rooms, 2 dining areas, huge front and back yard, chickens, a pool, double carport etc. It was my 2 daughters and I living there, sometimes with another friend or boarder. The house was way too big. I kept too much stuff. I couldn't maintain cleaning the entire thing, the yards, raising my daughters, my health and my company. Something had to give and it did - my health, the house and my company all suffered. Now, I live in a 2 bedroom unit. I own almost nothing. It was furnished when we moved in. My kids share a room with a bunkbed and bookcase each. We have maximised the storage spaces and have all we need. We walk everywhere, so no need for a car. Our complex has a pool, gyms, a spa. saunas and everything we need is here. It is also extremely secure. 3.) Learn to say NO! No is a complete sentence. Say it - No. You don't need to explain yourself, provide excuses or say yes to things you don't want to do. Say no. Or "No, thank you." Stop taking on everything and doing everything for everyone. Put yourself first. Work out what you need, what you have time for and what you are willing to do. Then stick to your limits. Don't feel guilty. Every time you say yes to something, you are saying no to something else and often it is no to yourself. I hear about 'mummy me time' all the time and it's usually things like '"take a bath, with candles and bath salts..." or "go to the salon and get your hair done." Those are basics. Schedule them in and do it. Don't class it as 'me time'. You did it before kids, you did it when single, it was part of your life and seriously, a hair cut is basic. Block out time every day for you. Whatever it is you want to do, do it. Don't say things which you should get to do and everyone does are 'me time'. Make real time for yourself. I speak a lot on domestic violence and made the decision this year to scale back. It is a point of stress for me. Getting ready for school in the morning was at times stressful. I put up the list of what my daughters need to do every morning, afternoon and evening. Now they pack their own lunch, get ready for school and do pretty much everything themselves, only asking me if they need help with something. Cleaning has been a sore point. I have looked into hiring a cleaner (although getting them to respond in a timely manner has been a stress on it's own!). We have outlined everyone's chores and each night everyone goes through and helps tidy up, then at other times we spend an hour as a family cleaning deeper. This reduced my workload and makes for a cleaner, happier home. Having been a single mum for a while, it was hard for me to take care of myself. I would ask for babysitting from family for me to attend work events, yet struggled to ask for any other reason. I worked during school hours and often after school, in the late evenings. I did everything I could to provide for my family. This meant I put myself last. I started looking at what I pay for and what opportunities there are for me to use what i have already to take care of myself such as what is available in my building, parks close by, health insurance, gifts I get for birthdays etc. Set yourself a budget. Track your spending. Reduce spending where possible and learn to live within your means. Get rid of your debt and save to have an emergency buffer. If you don't earn enough, look at ways you can make more money such as online surveys, mystery shopping, cleaning, ironing, lawn mowing, blogging etc.